Purpose: Use this document as a reference searching for a specific social security number in ctcLink. Click in the National ID field and enter all of a portion of the SSN. 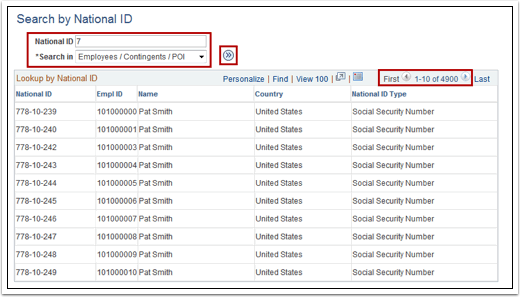 The Lookup by National ID table displays a list of employees whose national ID begins the desired search criteria. The Search in list enables further narrowing of the search by selecting employees or dependents and beneficiaries. Select the appropriate group from the Search in List drop-down menu. Search the list for appropriate employee by using the page forward and page back arrows.